Bayan-Ulgii aimag. Region of Mongolia. Places to visit to Bayan-Ulgii aimag. Aimag. Aimak. Place to visited in region of Mongolia. Sights of intersest. Bayan-Ulgii aimag. Altai Tavanbogd National Park. Khokh Serkh Strictly Protected Area. Siylkhem Nuruu National Park. Develiin Aral Natural Reserve. Tsagaannuur. Bayan-Ulgii aimag was established in 1940. Called "the Roof of the World", Bayan-Ulgii is a far-off land of high mountains (the Mongol Altai - Tavan Bogd mountains with 4,373 m peak) torrents and glaciers, inhabited by Kazakh, a minority who has a different culture from the Mongols, herding yaks and goats and hunting with trained eagles. Bayan-Ulgii aimag is situated in the extreme West of Mongolia, on the West and North it borders with the Russian Federation and on the South-West with the People's Republic of China. The Nairamdal peak 14,350 feet (4374 m) of the Altai Tavan Bogd mountain is the highest point, Khovd, the biggest river (321 miles /516 km in length) in the country flows through the territory of the aimag. There are many fresh water lakes in Bayan-Ulgii. Tolbo and Dayan lakes are the largest. This aimag is well-known for Ak-su, Chigertei and other springs. Every part of Bayan-Ulgii aimag is suitable for pasture. 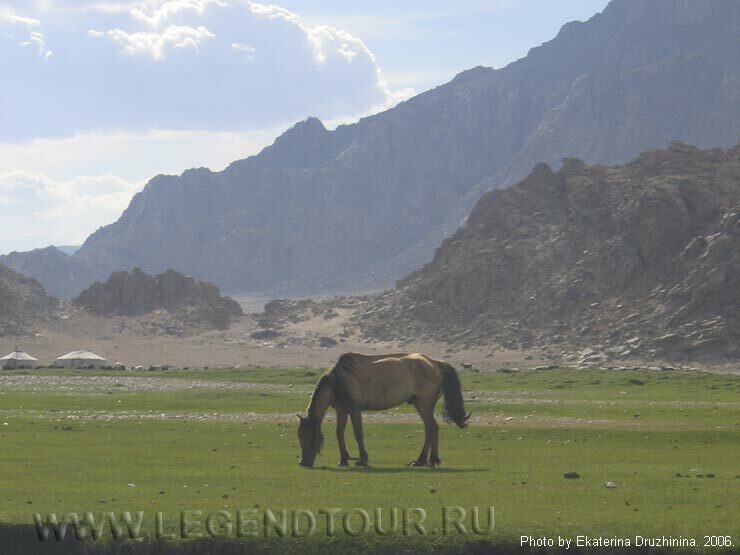 Rich flora of Bayan-Ulgii includes kobresia, sedge in the mountain plateau, gooseberry and ribes altissimum, also wild cherry, and sea bucks can be found along the banks of streams and rivers. 10 percent of the area is forest, consisting mainly of larches. Geological surveys have proved that this territory contains fossils, ferrous and non-ferrous metals, oil and building material resources. There are wild sheep, ibex, and snow leopards in the Altai high mountain range and marmots, foxes inhabit the lower slopes of mountains. There are bears, lynxes, and squirrels in the forests. 80 percent of the population is Kazakh and 17 percent is Uriankhai. In 1998, Bayan-Ulgii aimag harvested over 3.000 tons of grain, 600 tons of forage, and 21.452 tons of potatoes and vegetables. The coal mine of Bayan-Ulgii aimag produces 404.000 tons of coal and it's trade turnover is over 166.7 million tugriks. 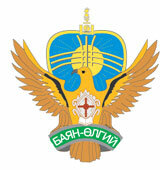 The Mongol Altai Nuruu is the backbone of Bayan-Olgii. The highest peaks, many over 4000m, are permanently covered with glaciers and snow, while the valleys have a few green pastures, which support about two million livestock, as well as bears, foxes and lynxes. These valleys are dotted with small communities of nomadic families enjoying the short summer from mid-June to late August, as well as some beautiful alpine lakes. The ethnic groups who call Bayan-Olgii home are comprised of the Kazakh, Khalkh. Dorvod, Uriankhai, Tuva, and Khoshuud. Unlike the rest of Mongolia, which is dominated by the Khalkh Mongols. About 90% of Bayan-Olgii's population are Kazakh, almost all of them Muslim. The remaining 10% are mostly obscure minority groups. Many people in the aimag speak Kazakh, so if you have spent time perfecting some conversational Mongolian, you may be devastated because many Kazakhs won't be able to understand you. There is bound to be someone nearby, however, who speaks Mongolian and, possibly Russian, but certainly nothing else. 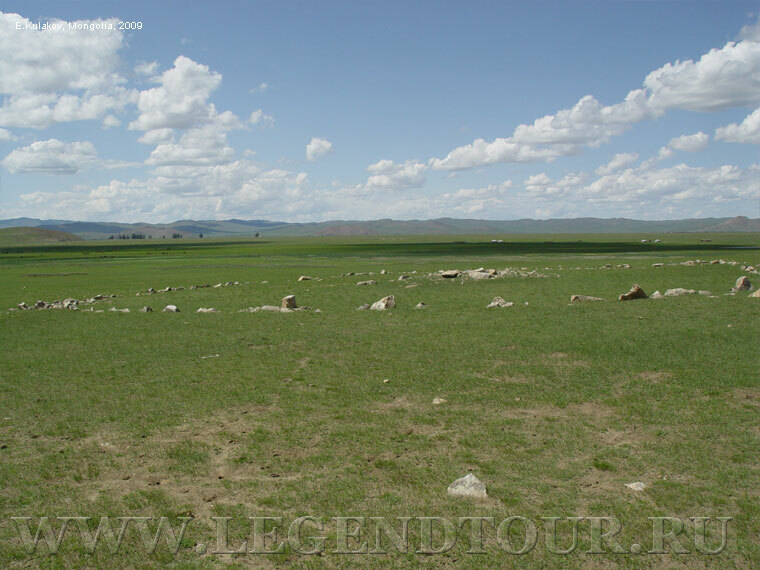 The aimag has a rich collection of archaeological sites, with many balbal (Turkic stone figures believed to be grave makers), deer stones, kiirgans (burial mounds) and a remarkable collection of 10,000 petroglyphs near the Russian border at Tsagaan Sala (also known as Baga Oigor). If you are particularly interested in these remote and obscure sites contact the Mongol Altai Nuruu Special Protected Area office in Olgii. Most of the parks come under the jurisdiction of the Mongol Altai Nuruu Special Protected Area. Environmentalists hope that further sections of Bayan-Olgii will become national parks to preserve the argali sheep, ibex and snow leopard, as well as the important sources of lakes and rivers in the Great Lakes depression in the Uvs and Khovd aimags. Altai Tavanbogd National Park (636,161 hectares). Takes in Tavanbogd Uul, Mongolia's highest mountain, and the stunning lakes of Khoton, Khurgan and Dayan. Fauna includes argali sheep, ibex, maral (Asiatic red deer), stone marten, deer, elk, Altai snowcock and eagles. Ulgii (Olgii). Elevation 1710m. Olgii, the capital of the aimag, is an ethnically Kazakh city that happens to be in Mongolia. You can certainly feel that you are in a Muslim-influenced Central Asian region, rather than in Mongolia: many places have squat toilets; in the city, there are signs in Arabic and Kazakh Cyrillic; the market, which is called a bazar rather than the Mongolian zakh, sells the odd kebab (shashlyk) and is stocked with goods from Kazakhstan. Olgii is 1645km from Ulaanbaator but only 225km from Russia. Tsast Uul. The two sums (districts) of Altantsogts and Bayannuur are about 50km south-east of Olgii, on the border with Khovd aimag. They are full of lush valleys with friendly Kazakh and Mongol nomads in summer, dozens of tiny unmapped lakes and soaring, permanently snowcapped peaks, such as Tsast Uul (4193m). Altay Tavanbogd Natural Park. This stunningly beautiful park stretches south from Tavanbogd Uul and includes the three stunning lakes of Khoton Nuur, Khurgan Nuur and Dayan Nuur. It's a remote area, divided from China by the high wall of snowcapped peaks, and known to local Kazakhs as the Syrgali region. All three lakes are the source of the Khovd Gol, which eventually flows into Khar Us Nuur in Khovd aimag. It's possible to make rafting trips down river from Dayan Nuur, though no agencies offer this at present. There are many archeological sites in the region. 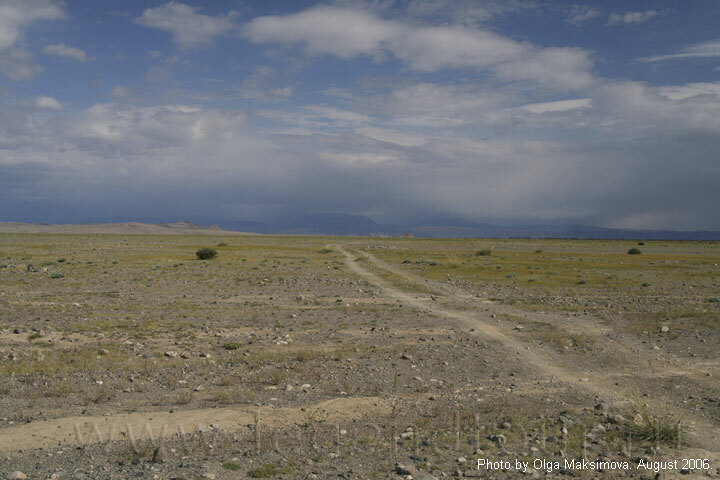 As the main road through the region swings towards the southern shore of Khurgan Nuur you can see a stupa-like construction and several burial sites. Nearby is a balbal (Turkic stone statue) and the remains of a processional pathway. Further along the road is a wooden Kazakh mosque, with a ger-shaped roof. Further north-west, along the south-western shore of Khoton Nuur, the road deteriorates and there are several rivers to cross as they flow into the lake. North-west of Khoton Nuur the mountains close in and there's some fine trekking possibilities. Tolbo Nuur. Tolbo Nuur (Frog Lake) is about 50km south of Olgii, on the main road between Olgii and Khovd city, so it's an easy day trip or stopover. The saltwater lake is high (2080m), expansive and eerie, but a bit disappointing because the shoreline is treeless. There are a few gers around the lake, and the water is clean enough for swimming if you don't mind icy temperatures. If you want to see, and camp at, some better lakes, keep traveling on to Uvs aimag. The map of Bayan-Ulgii aimag.